The eTray laptop tray. Luxury for laps and for laptops. eTray laptop trays are big, beautiful custom-made lap trays designed to make laptop computing safer and more comfortable. They are tough, heat-resistant and large enough so you can use a mouse - exactly what serious laptop user's need. Built-in shield layer that deflects heat and electric fields away from your body. Flat deck allows the free flow of air to your computer's cooling system - no more laptop overheating worries. Insulating conformable beanbag cushion fits your lap exactly for extreme comfort. Mouse mat surface provides precision tracking with all types of optical mouse - good for gaming, graphics, or any other application where accuracy is important. Top quality construction - hand made in the UK to last a long time. Hard wearing vinyl textured mouse-mat surface - will not wear out after only a few weeks of use. Available in two sizes to suit different sized laptops - choose your eTray to suit your working style. Choose from a range of unique inkjet printed designs, a range of plain colours, or send us your own image so we can create a personalised laptop tray for you. 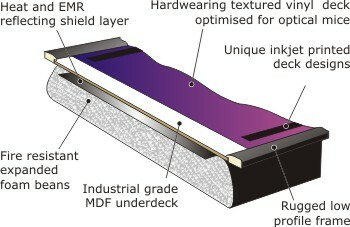 The eTray difference - this cutaway view shows how the unique eTray laptop tray design is engineered for laptop computing.